As health IT marketing committee members for Tennessee HIMSS, our team is responsible for many of the content marketing tactics that reach hundreds of leaders in the health IT field. Our recent participation in the Summit of the Southeast—a Nashville HIMSS conference—concluded with a recap of the event published on the organization’s website. If you weren’t able to attend this informative event, we hope you’ll enjoy a summary of the recap below. For the full recap, visit the TN HIMSS blog. From blockchain to virtual reality, artificial intelligence to population health analytics, today’s emerging health IT trends were ever-present at SOSE, from the main stage to the Matchmaking Parlor and lounge. 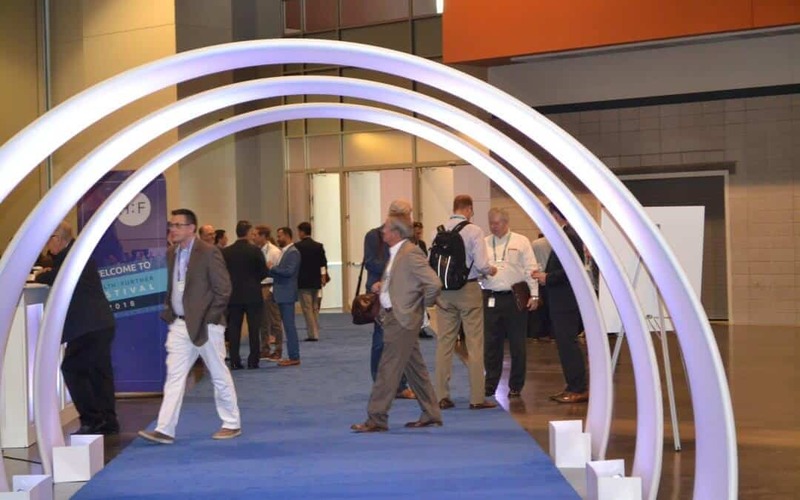 And in fact, networking was the name of the game, with many attendees making new connections and learning from industry experts and colleagues about the latest in health IT marketing and sales. Most of these individuals made their first stop at our Entrepreneur’s Alley, which had the excitement and energy of a crowded street fair. Today’s most visionary startups were also looking to pitch their unique value proposition to any interested parties (but especially potential customers and investors!). Sponsors and exhibitors were also on hand in our Innovator’s Row, which presented a variety of health IT marketing opportunities. Of course, the most engaging space at SOSE is the main stage, where attendees access knowledge from execs at some of the biggest disruptors in the industry. This year’s event kicked off with an incredible session by Rick Starbuck from Change Healthcare on Practical Innovation—dispelling common myths and exploring the most important strategies to enable real customer value and lasting innovation. Innovation in a very specific field—the internet of things (IoT)—was also a topic of discussion between Mary Alice Heston of Salesforce, a leading health IT marketing automation support firm, and Tammy Hawes from Virsys12 as they detailed how IoT will help address industry challenges like rising healthcare costs and an aging population. Bringing Day 1 to a close was the topic on everyone’s mind—blockchain—including a deep-dive session by expert Emily Vaughn from Change Healthcare and Nelson Petracek from TIBCO. Another common theme throughout the conference was an exploration of the next generation of health IT marketing, employee recruitment and product development—including emerging trends and challenges that could inhibit growth. We brought together some of today’s leading experts to talk about these topics in our engaging panel discussions throughout SOSE. A panel on Apprentices in Workforce Technology detailed the importance of training and apprenticeships for organizations looking to attract top talent. Another panel on Cybersecurity touched on some of the most pressing problems our industry faces as we look to safeguard our industry’s most valuable assets. If you attended this year’s SOSE in Nashville, TN, we hope you left with new connections for Health IT marketing, insights and practical knowledge. Don’t forget to rate your favorite sessions in the Health:Further app, where you’ll also find important news and recaps and summaries of all of the sessions. We hope to see you all again next year!